Cyclists set out from Tioga Pass. Exploring Yosemite’s snowbound high country, quiet and deserted, richly rewards hardy trekkers who labor to reach it in winter. Though there’s also much to like about the easy access mountain roads provide in summer. These two elements come together for just a few days each year, and for bicycling Yosemite lovers, it’s a trip to savor. Between the annual snowplowing of Tioga Pass Road and the highway’s opening to moy tor traffic a few days later exists a short window of golden opportunity. Grand views of snow-covered peaks, the chance to cycle a breathtakingly scenic route without noisy automobiles, and a warm and comfortable cabin are a few of the outing’s selling points. Careful timing and planning are key, because the park does not promote this use of the pre-opened road. After coveting the trip for years, I convinced my friend Bob Leung to take it with me last spring. Anxiously we watched the weather and road reports for our chance to strike in late spring. When the snowplow crew punched through Tioga Pass in mid-May, we both dropped everything and drove from the Bay Area over the just-opened Sonora Pass, south to Lee Vining, and up to the gated Tioga Pass, arriving on a Friday around 5 p.m.
Posted to the gate was a sign that tested our resolve: “Road closed to automobiles, bicyclists and hikers.” Ouch! Neither of us relished a pricey ticket. But then, neither of us wanted to give up and reverse our 250-mile drive back home. So we loaded up our panniers and lifted our bikes over the gate as I started mentally computing various ranger-evasion scenarios. Within five minutes of starting our ride into Tuolumne Meadows, a park service truck drove up to us. Our hearts sank and I was sure we were busted. To our surprise, though, the officer simply asked us to stay off the road during certain hours on Saturday as the work crew continued touching up the road. On Sunday, he told us, the crew would not work and the road would be open to bikers all day. In retrospect, this was the crux of the trip. The ranger could certainly have handled it differently and another might well write the tickets next time. But dumb luck or karma carried us through, and we enjoyed the rest of the outing much more thanks to the peace of mind that comes with a green light from the feds. Riding from Tioga Pass to Tuolumne Meadows gave us thrills as we dropped 2,000 feet in eight beautiful miles. Effortlessly we coasted down the tree-lined, snow-banked road beneath clear skies that slowly took on an exquisite shade of pink. Then we reached the Tuolumne Hut, a gem of the high country. In winter months, the park leaves this building open to visitors for free on a first-come, first-served basis. Inside are bunk beds, lights, a table, a hot plate and wood for the stove. On rare occasions skiers fill the cabin, but on this night we were the only occupants. And to top it off, the food cache our buddy had left behind the previous autumn was still there and untouched. We toasted him as we cracked open the beers he’d left behind. Hiking and bouldering around Lembert Dome and Puppy Dome entertained us the next morning. Then in the early afternoon, the friendly neighborhood ranger drove by again and told us the day’s work had finished early. We were welcome to bike to our hearts’ content. So we geared up and pedaled west eight miles to Tioga Lake, which we found in an interesting and unusual half-frozen state. 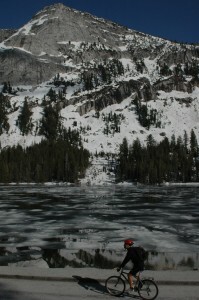 Bob Leung rides past a frozen Tenaya Lake. Everywhere the mountains were alive with running water and signs of wildlife emerging from winter slumber, and aside from a few kindred spirits on bicycles, no one else was there to see it. To bike further west and complete a point-to-point trek through the park was tempting, but required transportation arrangements that we hadn’t made. So after another night in Tuolumne Hut, we rode back to Bob’s truck at Tioga Pass and drove home, grateful that we’d come and grateful for a reason to come back. Timing is everything! The park tries to get Tioga Pass Road open by Memorial Day weekend, which would make cycling Sunday May 23 in 2010. This depends greatly on the level of snowpack, though, and there are no guarantees that the park will open the road to cyclists for a day. Road status can be determined in various ways. Check the Tioga Pass webcam at http://tenaya.ucsd.edu/tioga/ or news reports about the snowplowing operation starting in early May. The ranger we met said visitors in future years might get road information from the Mono Lake Committee Visitor Center (760-647-6595) or perhaps even the Whoa Nellie Deli at Lee Vining’s Tioga Gas Mart, also known as the Mobil (760-647-1088). Tuolumne Hut serves as a campground office in summer. As you head west on Tioga Pass Road, it’s just past Lembert Dome’s parking area and across the Tuolumne River bridge. The cabin has mattresses, though visitors need sleeping bags. In the unlikely event that visitors fill the cabin, be prepared with a bivvy sack or tent.